Megatron is one of the most adaptable transformers ever since 1984. While his autobot counterpart, Optimus Prime, remained a truck in more or less all his incarnations, Megatron went through severe changes in both his design and his alternative modes. 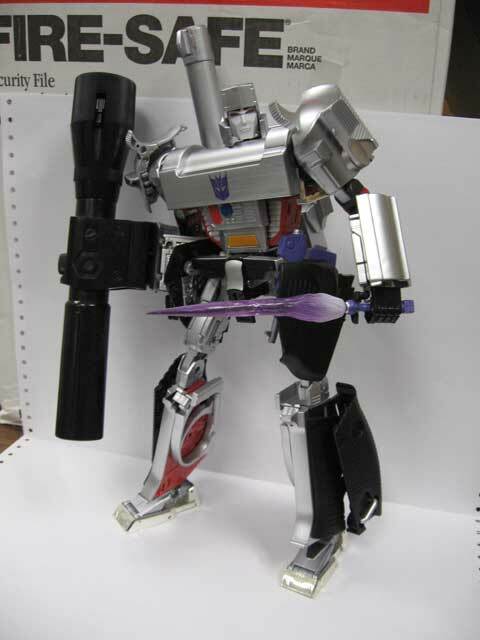 The toy used for the original Megatron was released sometime during the late seventies, and was later re-issued with the stock and silencer we all know. When transformers were grasped as a concept and imported as a toy line, the executives back then choose Megatron to be the evil leader solely because his figure packed more punch for the buck; the accessories put him on par with Optimus and his trailer in terms of playability. 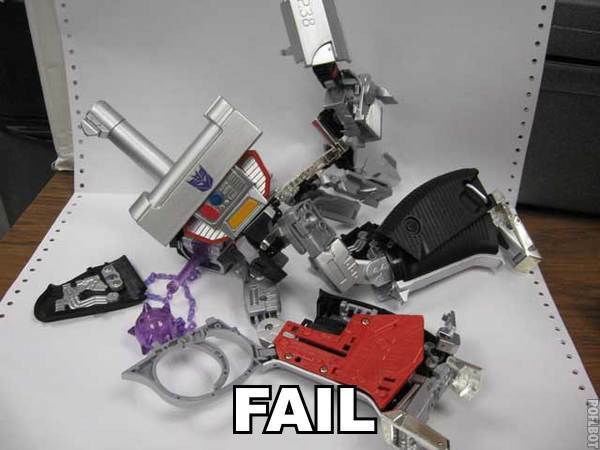 Toy gun laws changed soon after, and Megatron went missing from future assortments until Galvatron [different toy, more or less same character] was released. Ever since, Megatron was released as military vehicles [jets and tanks], prehistoric and mythical beasts [dinosaurs, dragons], huge spaceships and stylish futuristic cars. While undoubtedly each of these figures carried the name, there were virtually zero homages to the original. 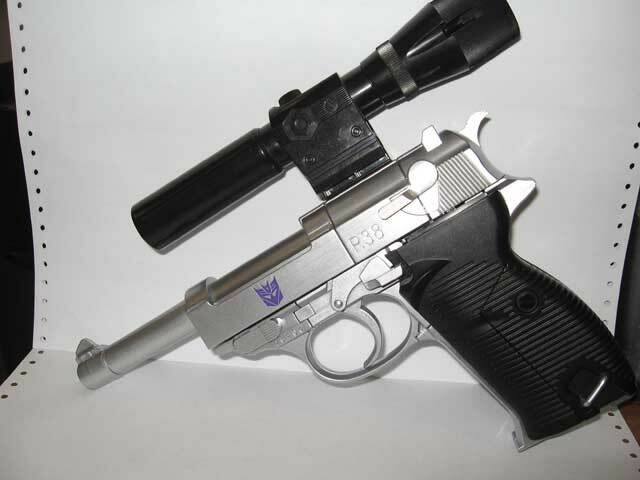 Due to more lenient gun laws in Japan, the original Walther p38 Megatron was re-released several times in Japan, but never again in America and subsequently, Europe. It goes without saying that Masterpiece Convoy [released a good 3 and a half years ago] is the ultimate Optimus Prime figure. 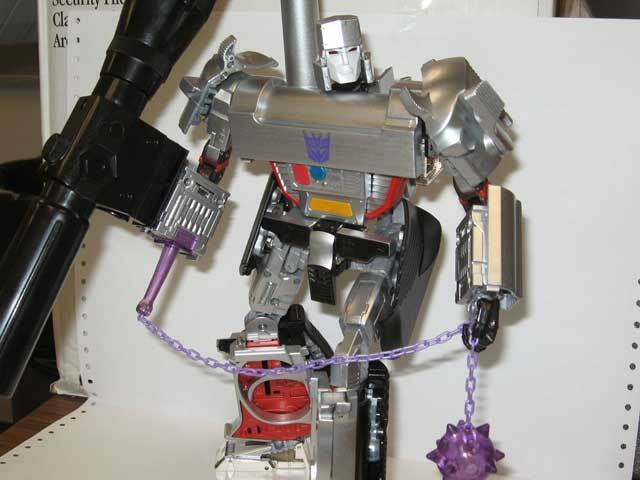 Seems like somebody at TakaraTomy decided to give Megatron the same treatment. 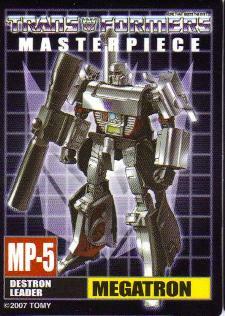 Creating a masterpiece 1:1 Megatron in gun mode was scrapped in favour of a robot mode on par with Optimus Prime, hence Takara abandoning a realistically scaled alternate mode. The figure was available on March 2007 in Japan and sold out pretty quickly-almost all Japanese vendors I know list him as discontinued. Megatron makes a triumphant return as an oversized Walter P38. Much of this has to do with the fact that if his robot mode was to be in scale with Convoy, his gun mode would suffer. The gun is too big and frankly, it's bigger and takes more space when compared to Masterpiece Convoy. It measures a bit more than 28 centimetres from muzzle to hammer, 18 centimetres from grip to scope base and has a grip length of around 7 centimetres. The scope is 23 centimetres long. Putting that aside, Takara did a fantastic job in scaling up the gun. Even though it's oversized, it has near-replica detail that shines through. The safety lever can be turned on and off and the trigger can be pulled, but that's all the playability (I'm deliberately ignoring the scope for now) he gets. Frankly, I don't see how they could squeeze more gimmicks in (extending magazine, working hammer etc) without weakening the robot mode. Sculpted detail is something this baby's not shy of. The P.38 insignia is meticulously carved besides the safety lever, as well as a (fake) production number near the trigger, reading 4640e. The grip has intricate carving lines all over, as well as (fake) screws sculpted on for accuracy. The lever to release the magazine is sculpted on but does not work. It's interesting to note that the exact part on the opposite side has fewer details and looks plain in comparison. The Decepticon insignia is tampographed on both sides and does not detract from the look of the figure. The muzzle looks realistic without too much sculpted detail. On the back of the gun sculpted panel lines adourn the hammer and even a sight is moulded on; however, the scope attachment is right in the way. Speaking of which, a black connector piece (with a part that extends to one side of the gun by sliding down) is the key to getting that oversized scope on him. The scope has some moulded detail on (namely carved lines on the back and sides, protrusions near the front end) and two fake magnifying levers. The main gimmick is the red LED that shines as you press on the lever on the side. Even though you can see on the inside of the scope, there's a jumbled mess of circuitry for the LED in there. The light that shines out is not concentrated and has a radius of over 40 centimetres. The paintjob on my figure is top-notch and has very few smudges-probably where the parts were connected to the runner. Takara used a semi-gloss black for the scope and grip and metallic silver for the rest. The texture of the paint on the plastic on some parts is simply -MARVELOUS-, especially on the parts with the Decepticon symbol. The muzzle on mine has some scuff marks, the silver connector on the grip (more on that later) has a tiny chip mark and lastly, the Decepticon symbol on the right side has some black paint marks right above it. Overall, Megatron's very impressive and well executed in this mode if you don't mind the enormous size. Twirling your Megatron, cowboy style, is almost impossible. There's too great a gap between the trigger and the round part around it, there's the fear of disconnecting the grip while doing it, and lastly, the gun's a bit on the heavy side for something like that. A silver connector (looks like something can lock on there) is on the left side of the grip, probably a foreshadow for MP Megatron Complete edition that will eventually come sometime in 2008-2009. All in all, a very nice gun mode for a very nice figure. Following a very complex transformation, Megatron reigns an imposing robot mode. The transformation scheme is very puzzling and interesting, but borders on frustrating. There's too many parts that need to shift, extend and click that just refuse to co-operate. Getting him from gun to robot is admittedly much easier than in reverse, because you don't have to align every panel on his body to fit. Megatron stands a bit under 30 cms tall to his head, 34 to the top of the gun barrel. Much of his bulk is concentrated on the upper torso, whilst his legs are thin and rely on protruding panels to look thicker. Unlike MP Starscream (which, in retrospect, I now ADORE), the kibble fit in with the character and appear as parts of his limbs rather than extra junk. Unfortunately, all the extra panels connect to the limbs via ball joints, and most of them are prone to dislodging with the slightest pull. The aforementioned parts are: the covers on his upper arms, the waist armour, the calf armour and the gun parts that hang on his back. Articulation is plentiful and meaningful. Big Megs has 37 points of articulation, three of which are ball joints. The rest are ratchet joints (some a tad too tight) or plain, monoshaft joints (like the ones MP Convoy & Starscream use for the articulation point just above the elbow). A common mistake people make is that he uses ball joints for his shoulder articulation. It's actually a combination of a ratcheting joint and a swivel joint that evokes the articulation of a ball joint, only without the excessive wearing over time. The only meaningful point of articulation missing is a waist joint, but that's impossible considering how his spine is formed. The joint does exist, but cannot be used. The colours used are more or less the same as the ones in gun mode: metallic silver is used for the legs, arms, body and head, while black is used for some of the leg armour, waist armour, fusion cannon, joints in the arms and hands. Red is used sparingly on the waist, elbows (a stripe, really) and inner lower legs. His eyes are metallic red (like MP Convoy's). A bit of blue and yellow is also used for the mechanical detailing on his waist. The face is a lighter silver (almost white) than the rest, and his hips are gunmetal gray. A tad of plated silver is used on the die-cast parts. Speaking of die-cast, it's nowhere near as plentiful as it was on MP Convoy. The feet and "skeleton" (spine and parts his arms connect to) are made entirely out of die-cast, but that's it. The rest is durable, hard plastic (with a few exceptions here and there). I firmly believe that the figure would have benefited more from additional die-cast metal, particularly on the hip joints. This figure is not without flaws, and unfortunately, it carries quite a load of them. The biggest flaw, in my opinion, is how unstable the damn hip joints are. At least on mine, they don't lock on any position besides neutral (standing straight) or extended to the sides. They should be able to hold, but the weight of the figure puts a strain on them. Additionally, the knee joints were so tight (not a bad thing, but read on) I had to loosen them with a screwdriver because I could hear the plastic warping inside the joint. Moreover, fiddling with the arms is a chore. If you don't pop the gun part off the ball joint, you'll push the lower arm panels inside or open the internal panel. There's just so many parts that are supposed to stick out and you end up pushing them just to handle the figure. However, I am willing to look past all that and the fact that the leg module of the body sometimes disconnect as I try to pose him. The second biggest issue I have with the figure is the fusion cannon. Posing Megatron with it is a chore at best. The fusion cannon is so big it takes a lot of fiddling to do a simple straight forward pose with the cannon aiming at head height. A lot of pressure is placed on the already weak hips so Megatron ends up toppling over even if he's not posed, but just equipped with the cannon. Without the cannon, Megatron looks very plain as none of his other accessories measure up to his grandeur. Lastly, his other accessories are worthy of mention. My favourite would have to be the Kremzeek figure, cast in clear orange\yellow plastic. He's not much taller than 2 cms, but he's very neat. Miles ahead his Kiss Players counterpart. Following closely is the beam sabre, cast as seen in TF:The Movie. The hilt connects to the hand via a rectangular peg that locks on the wrist. The beam blade is detachable and the sabre fits nicely in the hands of Binaltechs as well. The purple gun seen in the movie is also present, but there's not much to say about it. Paint applications are okay, but it's simply to small to present a nice accessory to Megatron. In addition to all the above, the energon mace seen in the second episode of the original series is also present, and clips on either arm in the same way Convoy's axe does. The chain is a tad too long, but it's a fun accessory that firmly embodies this tyrant's attitude. All in all, Megatron is a swell addition to a serious fan's collection. He's really not meant for the casual fan as the transformation method is too complex and the figure is not as sturdy as one would expect. Recommended to all fans who want a leader to stand in with their awesome Binaltech collection. Transformation: 10. Easily one of the most complex and frustrating pieces in my entire collection. Durability: 4. I've seen many a sample where something was broken beyond repair. The leg module can be pulled off with some effort, the elbow joints can break, small tabs on the hip armour DO break and then there are more problems I probably have not read about. As long as you handle him carefully, he's okay. Fun: 9. I've been waiting for a figure of this character in this form for a long, long time. He delivers everything I wanted for my display, but loses a point because he's not as imposing without the huge fusion cannon. Price: 7. Adequately priced for a masterpiece, retailing at around 82 USD in Japan. The price might go up as I've noticed several reports of them being pulled from e-bay, making him quite a collector's item in the future. Overall: 7. I personally love the figure and am willing to overlook most of his problems (I was looking for a display piece, not a toy), but let's face it, he's not up to MP Convoy's sturdiness and durability, and he was never made to be played with.